Judith Chapman. Photographer Matthew McLean. Residents of the Coachella Valley are very fortunate that we share our desert paradise with several National Treasures of the Arts. We lost, however, one of America’s iconic performers with the passing of the legendary 97 year old Carol Channing last month. But we are still blessed with National Treasure performer-extraordinaire, stage actor, comedienne, TV and movie star now “retired” at 93, Kaye Ballard (never really retired from the business; she is just resting between gigs). Her film documentary “Kaye Ballard – The Show Goes On” was screened at the 2019 Palm Springs International Film Festival (PSIFF) to rave reviews. The third National Treasure star residing in our valley is a much younger TV star, film actress, stage actor and director who is known for her one-woman shows: the “Belle of Amherst”, a portrait of Emily Dickenson, “Vivien”, her tour de force effort as the beautiful, brilliant but troubled English actor Vivien Leigh, along with other personalities that she recreates. Ms. Chapman has toured her shows across the country. And, of course, Ms. Chapman is listed by some as the Queen of the Soaps. She was brought back by popular fan demand last season to once again play the scheming and formidable Gloria Bardwell, of the “Young and the Restless” TV show. Theatre audiences now have the opportunity to see her perform locally in the Desert Rose Playhouse’s sensational comedy production of “Looped”, hilariously and cleverly written by Matthew Lombardo, and brilliantly directed by former Desert Rose Playhouse artistic director Jim Strait. “Looped” is based on a true incident that involved stage actor and Hollywood star Tallulah Bankhead in 1965. Ms. Bankhead was already infamous for being, shall we say, difficult as a performer. Punctuality and following the norms of show business rules were definitely not her strong suit. Alcohol, drugs, and promiscuity is what fueled her world. America dearly loves its rebels. They’re the ‘Peck’s bad- boys and girls who flout the rules of society and drown themselves in public and private hedonism much to the delight of the tabloid readers. They may be colorful and quotable but they usually flame-out early in life. The story of “Looped” revolves around a key line of additional dialogue that has to be recorded by Ms. Bankhead in a recording studio and then reinserted into the film. It’s a simple request that all film actors are required to do when necessary. But the movie producers forget they are dealing with Tallulah Bankhead. The job of meeting and having her record the line falls to Danny (Mark Fearnow, in a nicely judged performance), a film editor who is unprepared to deal with the whirlwind star and ego of Tallulah Bankhead; a performer who never suffered fools easily. Miquel Arballo as Steve is the recording director in the studio booth who lends just the right amount of quiet professional frustration, in trying to do his job and then take his son to a LA Dodger baseball game afterwards. If this story sounds prosaic and not very engaging, you had better “fasten your seat-belts. It’s going to be a bumpy night”, to quote Bette Davis as Margo Channing, in “All About Eve”. 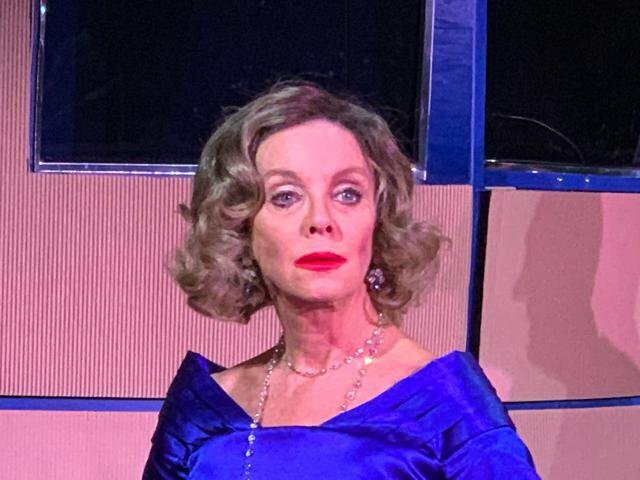 Judith Chapman’s towering comedic portrayal as Tallulah Bankhead, will loom large as a Desert Theatre League Best Performance by a Leading Female candidate, come the 2019 Desert Star Awards ceremony this Fall. The beauty of her performance lies in her overall professionalism, talent, and the inventiveness she brings to the task of recreating Tallulah Bankhead’s insecurities, salty language, warts and all style, and still have the audience in stitches with her impeccable timing, pacing, and stage business, that makes for a deliciously, sublime evening of theatre entertainment for adults (strong language). It’s pure Judith Chapman totally immersed and completely in command within the skin, body movement, quirks, and tics of Bankhead that reaches out and grabs the audience turning them into acolytes of an actor who knows how to take the stage and perform her special magic. This is what the great Noel Coward called having “Star Quality”. It’s reserved for only a few but when we’re in its presence, it is a golden moment in the theatre. A special kudo goes to Desert Rose Playhouse Producing Artistic Director Robbie Wayne, for obtaining the services of Chapman for “Looped”. The creative team led by director Strait features a small, intentionally cramped recording studio set design by Bruce Weber and a lighting design by the redoubtable Phil Murphy, with costume design by Ruth Braun and Robbie Wayne, along with sound design by Jim Strait and Miquel Arballo, and Paul Taylor, assistant to the director, complete the creative team. “Looped”, performs at the Desert Rose Playhouse Friday and Saturdays at 8 PM and Sundays at 2 PM through February 10, 2019. This is a Must See production. For tickets call the Box Office at 760-202-3000.Posted courtesy of Desert Local News.